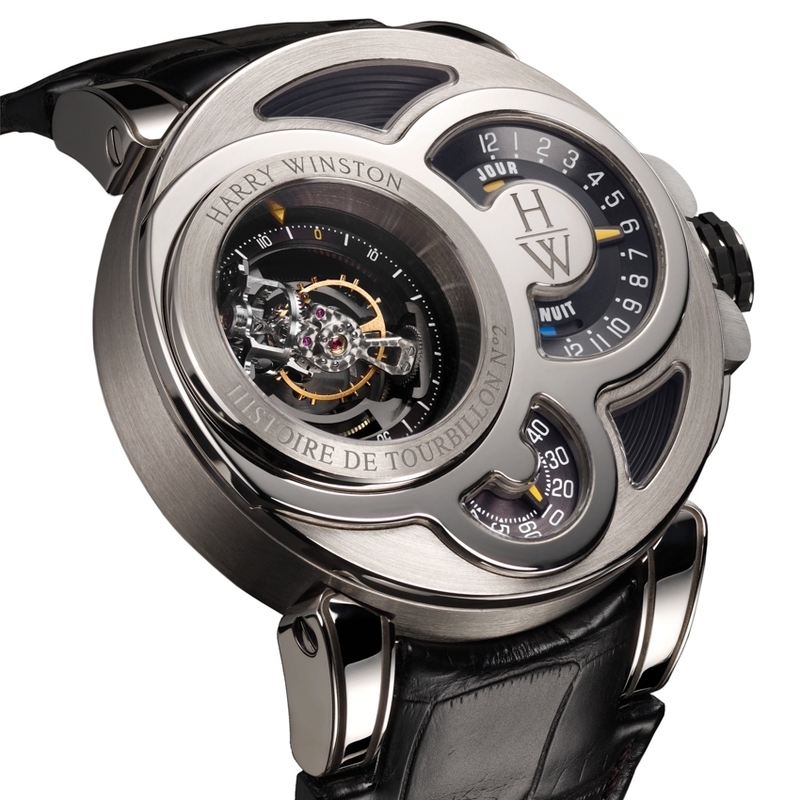 Histoire de Tourbillon 2 embodies the visionary spirit and the determination of Harry Winston to explore new dimensions in a daring and distinctive manner. The bi-axial flying tourbillon combines two concentric carriages to create a striking visual effect. Housed within an outer carriage completing one full turn in 120 seconds, the internal carriage containing the balance, balance-spring and escapement revolves in just 40 seconds. While this multidimensional regulating-organ complication plays the starring role, the brand’s signature excentric look is expressed in a resolutely atypical manner. Eight sapphire crystals punctuate the case, revealing the tourbillon coupled with running seconds at 9 o’clock, the hours with day/night indication at 2 o’clock, and the minutes at 6 o’clock. This is an Haute Horlogerie high-tech instrument that does not merely measure time, but actually lives it with vibrant energy and confidence. 20-piece limited edition. 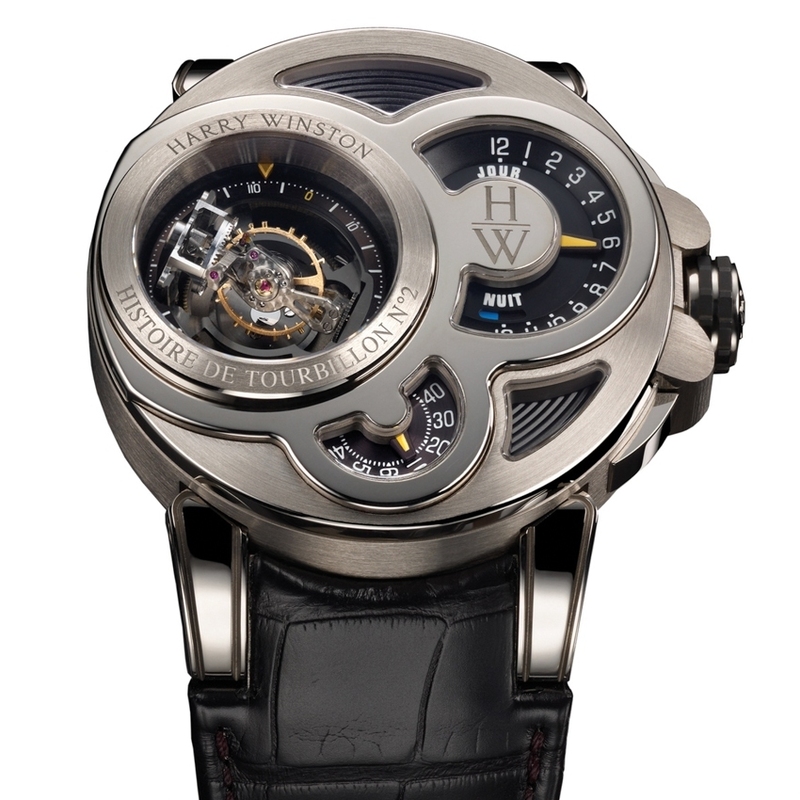 Hand-wound bi-axial flying tourbillon with outer carriage in titanium and internal carriage set at a 10-degree angle. 95 parts, circular-grained, polished and shot peened finishing. 50-hour power reserve.